A rig that helps to prevent the weight from snagging on the bottom when a fish is hooked. I have to say, it is not a favourite of mine but it is very popular, especially where fishing over rough ground. 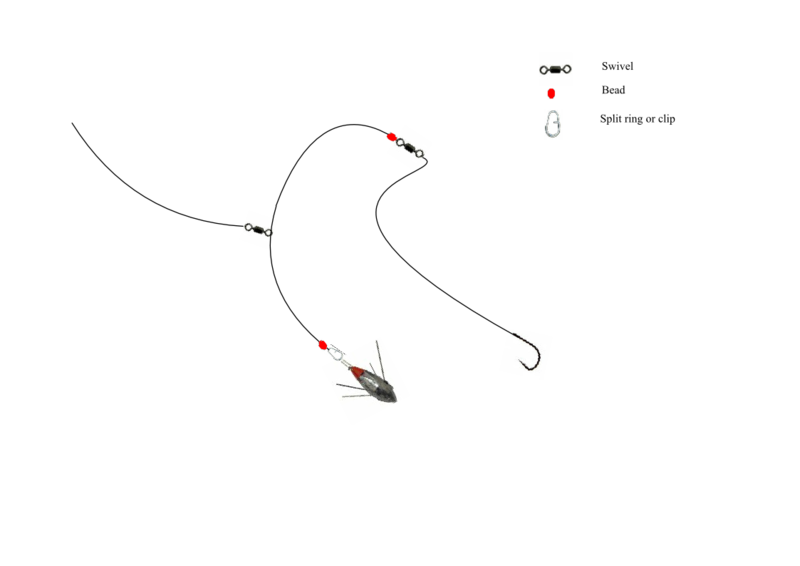 The diagram shows one constructed for use on a clipped rig, incorporating an impact lead with built in bait clip. This differs from one that uses as an impact shield with bait clip or just a lead link with bait clip. The idea here is just to show general principle of the rig and its construction. 1. Tie a swivel to the end of main line or shock leader. 3. To the other end of this length, thread a bead and thread the line through the swivel done in step one. 4. Thread on a bead and tie onto a second swivel. 5. To the second swivel, tie your hook length and hook.